did you ever wonder, what's behind the button "Import from file" in PFCG's Menu tab? This usually makes the "Import from file" button hard to use and thus unpreferable! 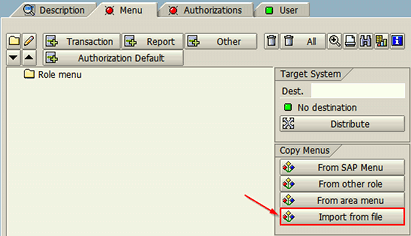 Let's say, you're trying to revise (and minimize) the authorization in a SAP client ex post, i.e. when the system has been in use for some while and nobody took care of proper roles. Moreover some (key-) users might already have created their own favorites, which – hopefully – reflect their tasks in the system. Wouldn't it be nice to be able to import those user favorites to a role and build adequate authorizations this way? Still there will be much to analyze and adjust — but it might be a good starting point! A user's favorites are stored in the table SMEN_BUFFC and SMEN_BUFFI (for the various kinds of link targets). So this is the place we'll get the menu data from. The file format from the above mentioned SAP Note 389675 only supports a subset of all possible favorite types: folders, transaction codes, URLs, Knowledge Warehouse links and custom types (we won't deal with the last-mentioned one). So in addition to reading and converting the favorites, we'll have to filter out all unsupported types of favorites. Create a new report in SE38 and paste this source code (don't forget to set a program authorization group). In the selection texts, tick "dictionary reference" for all parameters. Activate & execute the program. an optional file to save the data to. Once started, the report prints the converted favorites on screen and optionally saves it to the specified file. You might want to customize the report to download the favorites of several users at once — but be aware that you'll have to either save each user's favorites to its own file or deal with duplicate object IDs (and parent IDs and the sort order …)! If you're interested in role menus, you might want to check the AGR_HIER* tables. this week, a colleague pointed me to the possibility to hook your own code into SAP GUI downloads via a user-exit. Since downloads are always a big security - and data protection topic, I took a closer look. When downloading data to the frontend, the authorization object S_GUI is checked (with ACTVT 61). This is a very unspecific check, as it does not take the affected data into account – if you have appropriate authorizations, you can download roles, the SFLIGHT table or your colleagues' salary. It's just a client-wide "switch", which either allows or disallows downloads. Many authorization admins don't pay much attention to S_GUI, but rather focus on data access authorization objects. Anyway this is not sufficient, as downloaded data may be passed to third-parties easily or analyzed inappropriately. The first one is called by the GUI_DOWNLOAD function module – i.e. for each and every frontend download, while the second one is HCM-specific. To get started, I decided to inspect SGRPDL00, as this one has the best coverage. First of all, we need to create an add-on project via tcode CMOD to implement the user-exit. Enter the project name "SGRPDL00", click on "Create", enter the project attributes and then go for "Enhancement assignments". When you're prompted to save, say "Yes" (← hard decision) and choose a package ("Local object" is fine, if you're just playing around). … nice try, but just press Enter and you'll be prompted, whether you'd like to create the include. After ticking "Yes", you can start to implement the code, which will be called during every frontend download. and allows throwing the exception "NO_AUTHORITY" – which means that the download is forbidden. Paste this code to get you started, activate it and don't forget to activate the user-exit itself. The above code is a documented example… you'll for sure want to add your own code there; anyway it demonstrates a bunch of possibilities. One of the most interesting aspects is that it creates an Application Log entry for every download. Although the Security Audit Log provides similar functionality, it's possible to add additional information – the table name for SE16 in the above example code. Unfortunately, you don't have access to all variables from the calling program… which makes it a bit difficult to add useful information (have a look at how the include gets the table name for SE16). If anybody has a better idea, please tell me. The user-exit HRPC0001 is specific to HR/HCM and works a bit different. The implementation in include ZXP04U02 does not perform any check itself, but is rather expected to return a report and form name. This form is responsible for the check and may be located within the calling report's context – thus enabling your code to access any global variable therein. This way you can take the HCM-specific context into account to determine whether the download is okay or not. When copying data to the clipboard, S_GUI is not triggered – SAP Note 997201 provides a solution at the cost of a modification. If you mainly need reliable logging for each and every client, you might want to check the SAP UI Logging solution. If you ever wondered about the physics of S_TCODE authorization ranges, this post is for you. We'll take a look at the order of characters (which is essential for correct ranges) and the pitfalls to avoid. To keep things easy and since most of us (?) are probably using a keyboard with Latin-1 characters on it, I'll focus on the ISO-8859-1 character set… though this is not exhaustive, as your system might use UTF-8 or some other charset. Jump to Ideone.com to execute the code online or to Wikipedia for a table of ISO-8859-1 characters. Btw. : some characters – e.g. backspace – are not printable and thus not usable. Usually, SAP allows us to use 2 wildcard characters: * (match any number of characters) and + (match a single character), but for authorization values only the asterisk is valid; the plus sign is treated as a normal character (see SAP Note 136647). An asterisk at the end of a "From" value is never useful, but might be terribly wrong ! The reason for this is that the start value is the first character in the range and all "higher" character (combinations) have a "higher" value (i.e. A < AA < AAA). The range SU* … SU21 includes SU24 as well, because the "From" value already covers all SU… transactions. To be able to create valid (and sensible) ranges for S_TCODE, we'll next look at the characters allowed in tcodes, because all others are of no interest (at least until we take a look at the tcodes SAP created itself). CONCATENATE 'ABCDEFGHIJKLNMOPQRSTUVWXYZ_0123456789/' allowed_special_characters " Set to '+' in LSEUKFWM INTO allowed_characters. This should be the full range one has to take into consideration when doing S_TCODE… which is only almost true… because SAP is not bound to the above restriction! 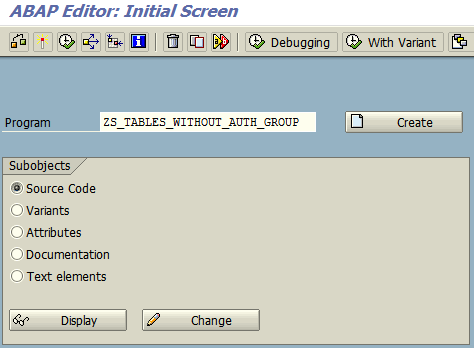 When you look into table TSTC you'll find tcodes which contain characters not allowed by the above check. At least on a number of systems, I found quite some. Used in any tcode ? First character of any tcode ? 0 … 31 ( control characters ) No No No Not usable. 32 ( space ) Spaces at the end of authorization values are automatically cut off. 33 ! Yes Cannot be used at the beginning of authorization values. 40 ( Yes Cannot be used at the beginning of any authorization value. 42 * No Wildcard character. If used in the middle of a value, all subsequent characters are ignored (see SAP Note 136647). 95 _ Yes Yes Yes Cannot be used as the only character in a value. 127 ( delete ) Not usable. (extended ASCII) No Usable, but won't make sense in the majority of cases. 168 … 255 ¨ … ÿ No Usable, but won't make sense in the majority of cases. using personal users to execute batch job steps is not a good idea! Of course it's convenient, but those users might vanish or their authorizations might change – but how to clean this mess up? Since SE37 does not allow you to select jobs by step user, one might try to use SE16 (→ table TBTCP) to find the affected jobs… which will drive you crazy, believe me! This time, I'll provide you with another nice report to clean up your system and prevent any batch-related headache! 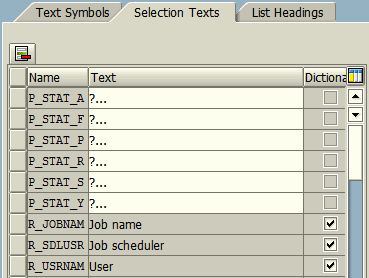 step user name (initially set to your user name, but try DDIC or SAP*). Job name — … self-explanatory. Job no. — the internal ID of the job. Scheduler — the user, who scheduled the job. Job status — … self-explanatory. Step no. — the step ID that matches your selection (the job might consist of more steps). Rept. name — the report or command. Job name — goto SE37 and show all matching jobs by name. Job no. — show only the particular job in SE37. Scheduler — open SU01 for the user, who scheduled the job. Step no. 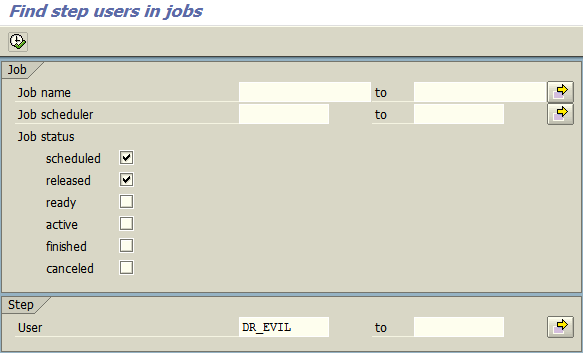 — display the step list of the selected job. Rept. name — jump to SE38. Name — show the step user in SU01. 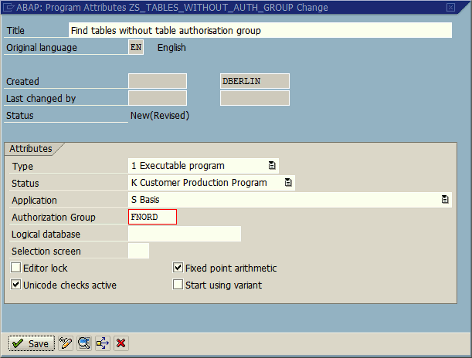 The assignment of tables to authorization groups is defined in table TDDAT; but it only contains registered assignments. If a developer never assigned his/her table to an authorization group, it won't appear in it. So the problem is to find all tables without an entry in TDDAT plus all tables with an empty entry there. Furthermore, some "tables" are uninteresting, e.g. structures, help views and temporary or local tables, as they don't contain any sensible data. Please, do not start Excel at this point… there is a better way! Obviously we need a way to list all unprotected tables (no matter whether they're in TDDAT or not) and automatically exclude all table- (and view-) types containing uncritical or no data. aren't local (i.e. not transportable) ← YMMV. … and choose a suitable authorization group (P_GROUP, marked red)! Copy and paste the source code. … and leave P_COUNT and P_EMPTY empty, tick "Dictionary reference" for the other ones. Select the range of Table names to inspect, e.g. "Z*". … which might heavily increase the runtime! Decide whether to Show empty tables (if you've selected the previous option). The Authorization group field is set to "&NC&" and empty values (only for tables that exist in TDDAT). 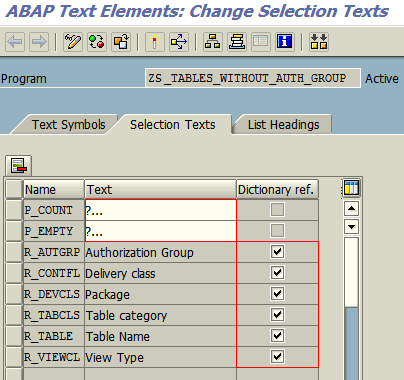 The Table category is set to exclude structures and append structures. The Delivery class option excludes tables for temporary data. The Package field is dynamically ❗ filled with all local packages on the system, the report runs on. In the ALV header, you can see the number of tables matching your selection and the number without an authorization group. Table name — … self-explanatory. Short description — table description from the data dictionary. AuGr — assigned authorization group (usually "&NC&" or empty). Description — the authorization group's description from TBRGT. Data — whether or not the table contains any data (only available if you ticked "Check table for data"). If it contains a flash symbol, the check failed. Cl.-spec. — whether or not the table is client specific. Log — whether or not the table has "Log data changes" enabled in its technical settings. 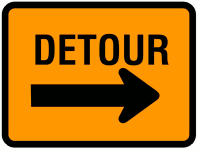 Del. class — the delivery class, which might give you an indication to classify the table contents. Package — the package the table belongs to (might point you to the "area" the table belongs to). Tab. cat. — the type of the table (e.g. transparent -, cluster -, pool table or view). Table name — jump to SE11. Short description — inspect the selected table via SE16. Data — show the number of entries in the table. Log — show technical table settings. Del. class — show all available delivery classes. Package — open the package explorer. Tab. cat. — show a list of table types. What do SAP and a punk rock band have in common?